One of the finest custom homes in mid-country Greenwich has hit the market for $18,750,000. 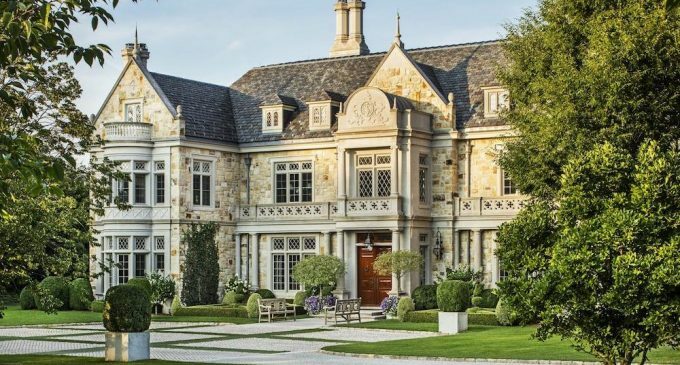 Architectural firm Wadia Associates worked closely with noted builders at Sound Beach Partners and interior designers at Rinfret, Ltd. to create this outstanding Jacobean country home. Beyond comparison, designed by Dinyar Wadia and built with the finest materials, including thick Vermont slate, solid stone and limestone exterior, carved limestone balustrades, and European tilt and turn windows, this home has the characteristics of a bygone era. There is a more than 12,600 square feet of space with six bedrooms, twelve bathrooms, an imposing grand entrance, large entertaining rooms and an inviting gourmet kitchen. The property extends 3 acres with classical landscaping, covered outdoor terraces, an outdoor kitchen and outdoor pool with cabana. The property is on the market for $18,750,000 with Houlihan Lawrence. Photography by Michael Partenio. We’ve included the architectural photography, to see the official listing photos click here.